Jessica and Adrian recently were married at Midginbil Hill in Uki. Here they share their great photos and the wedding. We bought all the flowers for our table decorations from the Rocklea flower markets and had a great time organising them into bouquets for our tables at 5am on the morning we headed down for the wedding weekend. Our bouquets and button holes were created by Elyssium Blooms on the Gold Coast. We had rustic posies of succulents, roses and sage coloured foliage. We walked down the aisle to Bright Eyes' First day of my Life. We met six years ago while we were both working at Greening Australia. How did Adrian propose, Jess? We were staying on Rarotonga in the Cook Islands for a friend's wedding, we’d had a fantastic trip relaxing on white sandy beaches and swimming in azure water. On our last day there, Adrian wove an engagement ring out of a palm frond and proposed to me on a deserted beach at sunset. How did you both feel on the day of your wedding? We were both super relaxed and excited, our plan was to have an enjoyable, stress free day and it was just perfect. We had so much help from our friends and family that everything just came together so smoothly. How did you choose your bridesmaids and groomsmen? Bridesmaids: I chose three of my closest friends - two of which I've known for 18 years and one for 12. It was so amazing to have them by my side on the day. Groomsmen: Adrian chose his son as his best man, his sister and his good friend Neil to stand with him. My dress was made by Wendy Makin in East Brisbane. Her dresses are made in Brisbane, which was one of my prerequisites as I didn't want to support sweat shop labour. They also allow you to change any details of the dress which makes choosing the fabric I wanted so much easier. Bridesmaid dresses Shana and Amy (either side of Jess below) had dresses I bought from modcloth.com I wanted them to have dresses that suited each girl and her personality. My third bridesmaid (Janet) was 7 months pregnant at the wedding. We really struggled to find her something nice so in the end I made her a skirt in a matching colour to the other girls and she wore it with a white top on the day. Grey suit pants with a vest, white shirt with rolled up sleeves, grey kicks and a flat cap. Groomsmen outfits: Matching pants to the groom all with mismatched white shirts, grey suspenders and ties. What was the main inspiration in having your wedding in Midginbil Hill? We were looking for somewhere that we could spend a whole weekend with all of our nearest and dearest. We also wanted to have a budget friendly, DIY wedding, Midginbil Hill ticks all those boxes. Our original thought was to have our wedding at Jess’s mums property on the other side of Mount Warning, but hire costs for all of the equipment we’d need seemed exorbitant so Midginbil was the next best thing! Did you have any obstacles with organising a destination and vegan wedding? Our only issue was that we forgot about daylight savings (oops) so we had to push everything back an hour. We had a few grumbles from various family members about not serving meat, but we expected that. Our main thought was that we wanted everyone to have a fun and relaxed night. The barn at Midginbil was perfect, and fitted in well with our rustic theme. We wanted everything to be as recycled and local as possible. For the table decorations, we used salvaged hessian, all of our cutlery and crockery was lovingly purchased from op-shops in the months preceding the wedding. For table numbers we used little plastic dinosaurs we had that Jess spray painted a uniform colour. We used old pallets for our signs and our vases were tin cans wrapped in twine. All the wood came salvaged from Adrian’s bush regeneration sites. We bought our flowers from local growers at the Rocklea markets. We used recycled corks as place card holders and the cutlery holders were also made from salvaged hessian by the bride. Our food was incredible! We can't even begin to describe how much we loved Anthea and her husband Caspar whodid our catering. They run a catering company from their home town of Mullumbimby and did an absolutely fantastic job. Anthea is a long term vegan and has worked in vegan restaurants around the world. We had a vegan and organic buffet dinner. We were the only vegans and we had only one vegetarian guest. Everybody absolutely raved about the food, there were a few grumbles when people found out that there was no meat, but everybody had seconds - one of my uncles had 5 helpings! We bought mason jars with handles in bulk online and Jess etched each guests name into their glass with glass etching paint so they had a personalised gift and a drinking glass to use on the night. They were a BIG HIT. We spent 4 weeks travelling around Europe and enjoying the lovely wintery weather. See MORE Vegan Weddings featured on VLV! 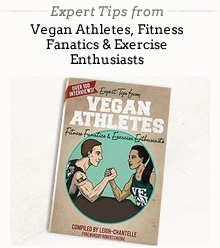 Also see the Viva la Vegan! Pinterest Wedding album. Read the blog when Leigh-Chantelle attended Chay and Flick's wedding (also) at Uki in July 2014.